the face is not that important right? I'm looking at the hand gesture..
and it looks like an very old one...is it really? with a very big answer . all about this this statue . i know about the story though . about this peculiar statue . i never came back . yep,i know , huge impression it must had on me . go figure that right ? Looks like a scene from a movie! Great work! Might I ask, where in Japan is this statue located? For I would love to visit it myself. I plan on it! I live in Ayase city so Im not too sure how far away from it I am, but early December sounds so good! you mean near tokyo ? you are way too far . but you have (let me think) . 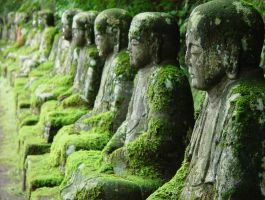 . .
Kamakura's great budah near you . I visited Great Buddah and went inside one of them. I loved it so much, I want to see more! Maybe I can take a few weeks vacationa and visit Kyoto. Would I have to fly or does the Shinkansen go that far? ¥12.000 just to get there . there is no Airport in kyoto btw or even nearby . I was looking at prices for the Shinkansen and its actually not a bad price at all. I want to ride it once before I leave here anyway. Ill be planning a trip. I also have a question. This year I went to SakuraGicho COSMO WORLD for New Years and Im not sure what to do this year. Do you have any ideas or recommendations? interest in new years eve . i am such a dork . I really like this. The composition and lighting, and the use of negative space is wonderful. I love the streaks on the statue's surface, like it's an eternally unchanging thing through storms and clear skies. My favorite part is how you can't see the Bodhisattva's face entirely, giving this air of mystery that's a little bit haunting. amazing! i really like the perspective and color. it's beautiful! Do you know which bodhisattva it is? Love the green shades and tones here! And the angle is great too! this is sick, brutha! awesome work. ok ok, I got it. Thank you so much for your art! you can actually write in japanese,it's nice for me to practice! Wow! That's really beautiful. The light and the composition makes this one perfect. You know, it looks like you captured a moment from some really awesome movie. This is such a gorgeous shot. what's the statue made from? thanks,i am happy now with this edition. bodhisattva statues are always so peaceful. my town has a lot of those spread around,i can't tell you that i feel the same feeling always but,sometimes i feel really quiet and peaceful around them. Impressive statue. I'm sure my mom would love to see them in Japan, because she's a Buddhist. She went to Japan a long time ago, when she was a little girl.